Valentine’s day is an occasion which is best celebrated with an excellent meal. It must be both, delicious and special. The most common thing couples do is reserving a table at a restaurant that someone may have recommended. However, if your reservations aren’t done on time, you might not get to experience the romantic dinner you had in mind. What you can try instead of going out is to spend a night preparing dinner together. Along with being a cheaper alternative, it’s also a way to make your partner feel special and loved. Here are some ideas for an incredibly romantic dinner for you to enjoy. Risotto is a hearty dish that can make for a perfect main course item. 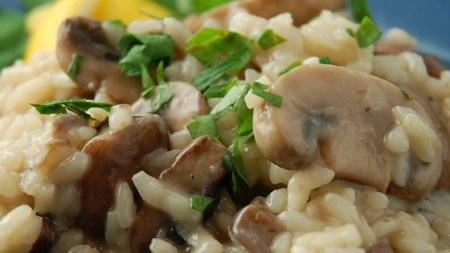 A delicious and extremely popular choice is a mushroom risotto. Accompanied by a light green salad and a great white wine, it will make it the perfect Valentine’s day dinner date. This dish has several advantages, it’s slightly unusual and the main ingredients are said to be natural aphrodisiacs. 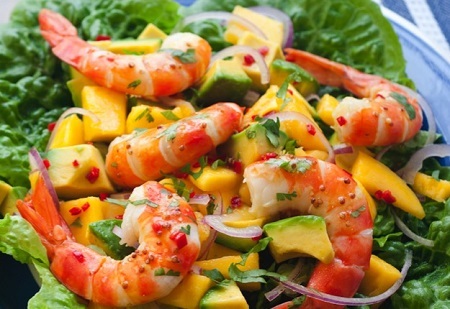 All you need is some cooked prawns, a whole mango, some lettuce and diced red onions, and lemon and balsamic dressing along with a pinch of salt. 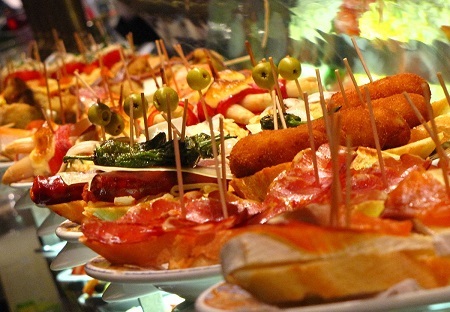 Pintxos are traditional Basque toasts served with toppings. All you need to do is pick out some good artisanal bread with various sauces and dressings, and get wakame seaweed, some cherry tomatoes and smoked salmon. The options are truly limitless. You can even make a competition out of it and see who can come up with the best combination. Salmon is a great idea to be incorporated into a homemade Valentine’s Day dinner. 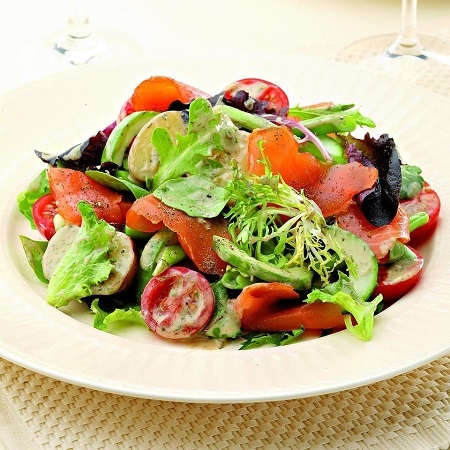 You can make a scrumptious salad with some lettuce, salmon, onion, cherry tomatoes, apple cider vinegar, olive oil, and a touch of salt and dill. If either you or your partner doesn’t enjoy salads all that much, a better alternative can be a Carpaccio. 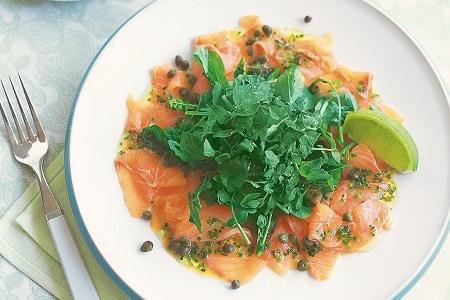 You can use fresh or smoked salmon which has been sliced very thinly. Along with that, you’ll need some capers, finely chopped red onions and vinaigrette made with oil. Add a touch of mustard, lemon juice, fresh ground pepper and salt to taste. Though these may sound extremely complicated, they really aren’t. The rice paper can be bought from any Asian food store. 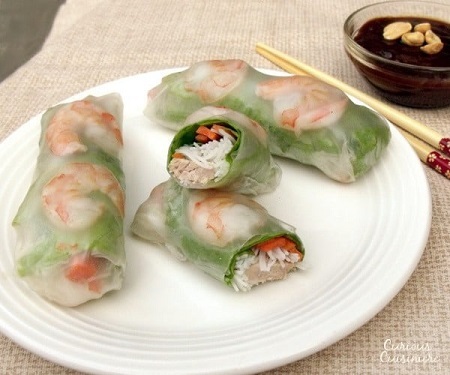 The filling can be made out of grated carrots, mushrooms, fresh lettuce, peanuts, and grilled chicken with a bit of soy sauce and just a touch of lemon. 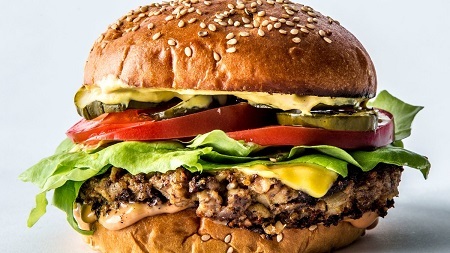 If you’re in the mood for light food, you must try vegetarian burgers. There are several options available for the filling. The ‘meat’ for the burgers can be made out of ground chickpeas coated in breadcrumbs and fried. It can also be made with spinach, mushrooms, or even a mixture of both. Pair them with artisanal bread, tomatoes, lettuce, onions, or whatever you like, and enjoy a hearty meal with your partner. No matter what you choose to cook for your romantic Valentine’s dinner, remember that the meal isn’t the only important part of the night. Cooking together can help you and your partner bond and even if it doesn’t turn out right, your evening will be memorable no matter what.